Mountain Boy Sledworks makes beautiful handmade wooden sleds in Silverton, Colorado. Seeing their toboggans, flyers, pull sleds, and kick sleds might start you wondering what size you should get and how fast you could take it down a snowy slope. Someone warn the former president. The human-animal hybrids have arrived. This Icebreaker sheep-man proudly walked the show floor. No animal-human clones here. Ellie May (brown) and Peggy Sue (white) of Alpacas of Montana are pure alpaca cuteness. Hollow alpaca fiber is warm, soft, and breathable, says the company, which makes socks and long underwear. Also pretty darn cute, baby hiking booties from The North Face. The Leave No Trace car from Subaru. Not for trail use. Spools of colorful merino wool from Smartwool. Bellied up to the Clif bar. Nuun's electrolyte tabs come in 10 flavors, and a rainbow of colors. In the "I didn't know I needed that" category, comes the SporkCase, a case for your Light My Fire Spork or two. Apparently I don't pay enough attention to keeping my spork clean. Climber Conrad Anker held a screening of The Wildest Dream: Conquest of Everest, his film about George Mallory's 1924 summit attempt. During their 2007 Everest climb in the documentary, Anker and Leo Houlding tried out some replica Mallory-era gear at altitude. Anker said he didn't get to keep the vintage clothing after filming, though he still has one silk shirt. The Wildest Dream is now playing in IMAX theaters. Anker suggested I put this picture on my blog. Who am I to disagree? And I think it's awesome that Mr. Anker looks like my junior college ecology professor..."Today, we'll be discussing the Krebs cycle..."
You're not that far off, pillowthread. We briefly discussed climate change while I was there after the film, along with a professor from one of the local universities. I tend to shy away from approaching celebrity types, but Anker was very personable and quite nice, one of those individuals who makes an effort to truly talk with and engage you. Indeed, Conrad is a very personable fellow. I have known him for a few years and did a little peak bagging with him. I thought I had posted this photo before from a hike where I went up Dana with him and his family. 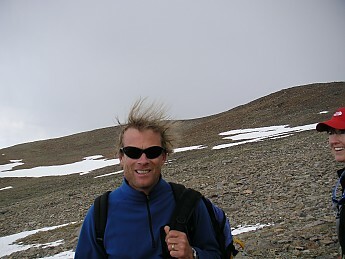 As we were sitting on the summit, Conrad commented that he heard crackling, and we looked to see his hair standing on end. We all immediately headed down the hill (that's a warning of impending lightning!). After we got down a ways, we paused long enough to get this photo. That's his wife Jenny at the right. 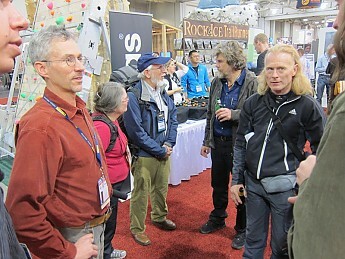 On the right is Duane Raleigh (publisher of Rock and Ice), Barb, OGBO, Messner, and others who I don't know. 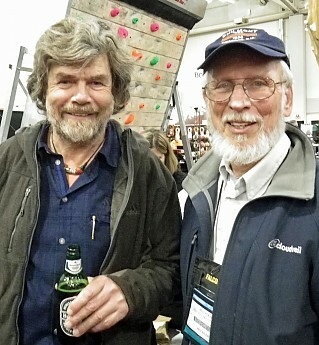 I had met Messner briefly when my son and I visited his climbing museum near Bolzano (in the Dolomites in northern Italy). We had a very pleasant conversation about changes in the museum and about some climbs in the Dolomites he suggested I would enjoy, along with news about some mutual friends. Brian has a huge book collection, and brought his 8 books written by Messner to get them all autographed. Thanks for sharing those, Bill. It would be really cool to meet Messner, I loved reading of his exploits. I've eyed up the sleds in the past, beautiful craftsmanship, just wish I had a reason to buy one. The icebreaker dude freaks me out. Agreed. He definitely got noticed though. I wish I'd met Messner too. I'll have to live vicariously through Bill. Is that guy with Icereakers?